Monrovia, Liberia - Liberia’s “Feminist-in-Chief,” H.E. 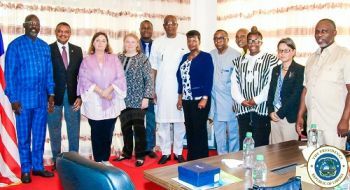 President Dr. George Manneh Weah, has once again reiterated his resolve and the commitment of his administration to uncompromisingly fight sexual gender-based violence and support individuals and organizations advancing the cause of women. The President, who pronounced himself ‘Feminist-in-Chief”, however said while government was aware of the importance of gender-based violence issues in the country, he was also not unaware of other factors, including cultural implications, which needed broad consultations and extensive education amongst stakeholders. The Liberian Head of State made the remarks Wednesday, January 30, 2019 at his Foreign Affairs Ministry office in discussions with national and international partners who are seeking Liberia’s commitment to the Spotlight Initiative. The Initiative aims to end violence against women and girls. European Union (EU), one of Liberia’s strategic partners, announced it would commit half a million to Liberia to combat sexual based violence (SBV).